A regular rule is suggested for the construction of optimal systems of discrete-frequency signals without repeated frequencies over arbitrary extended Galois fields GF(q), q = pm, with the following parameters: N = q – 1 is the signal length; J = q – 1 is the power of the optimal system of discrete-frequency signals; М = q is the number of different frequencies for setting-up the optimal systems of DF-signals. ZAMARIN, A.I. ; ANDREYEV, A.V. "Mnogourovnevye chislovye posledovatelnosti dlia formirovaniia signalov s psevdosluchainoi perestroikoi rabochei chastoty v sistemakh peredachi informatcii i radiolokatcii," Zarubezhnaya Radioelektronika, n.5, p.3-12, 1993. VARAKIN, L.Ye. Communication Systems with Noise-Like Signals [in Russian]. Moscow: Radio i Svyaz’, 1985. ZLOTNIK, B.M. Noise-Immune Codes in Communication Systems [in Russian]. Moscow: Radio i Svyaz’, 1989. IPATOV, V.P. 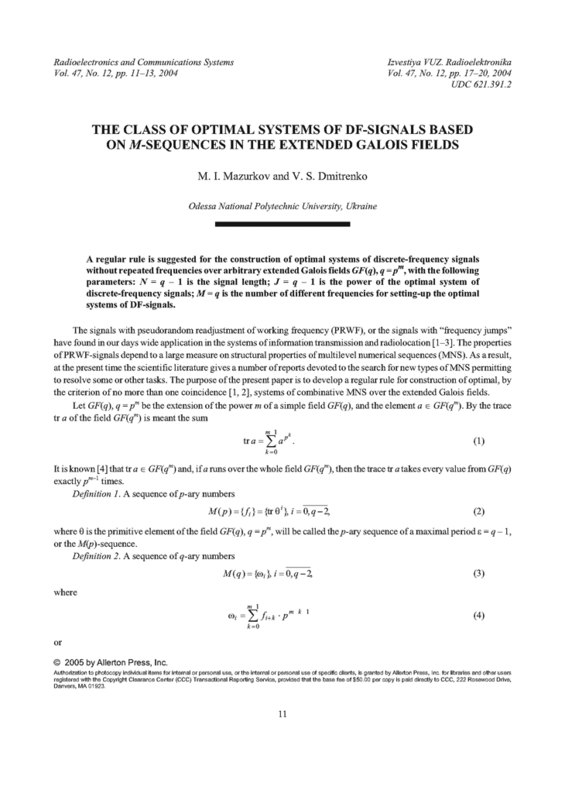 Periodic Discrete Signals with Optimal Correlative Properties [in Russian]. Moscow: Radio i Svyaz’, 1992. BLAHUT, R.E. Theory and Practice of Error Control Codes. Addison-Wesley, 1984. VINOGRADOV, I.M. Foundations of the Number Theory [in Russian]. Moscow: Nauka, 1981. KLIMENKO, N.N. ; KISEL’, V.V. ; ZAMARIN, A.I. "Signaly s rasshireniem spektra v sistemakh peredachi informatcii," Zarubezhnaya Radioelektronika, n.11, p.45-59, 1983.